why was this in your ear? 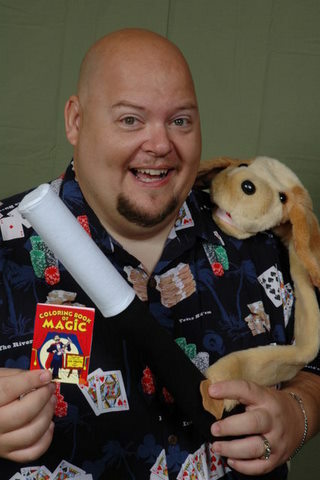 The funniest children's magician in Vegas! Doodad brings his sidesplitting comedy and jaw dropping magic to your next party. Your child is always the star of the show and the memories that his show will create lasts a lifetime! Doodad tailors his magic and comedy to the age of the guest of honor and it is always appropriate and fun for the whole family! With several packages to choose from, Doodad has a show to fit almost any budget. Servicing the Las Vegas, Henderson and Nevada area, Doodad is only a phone call away! I hired Doodad for my 6 year old daughter's birthday, He had us all laughing so hard with his super funny magic tricks (even the grown ups). He was well worth the price and I would totally hire him again and recommend him to my friends. Funniest Kid's Magician in Town! Doodad is my favorite children's magician. He is terrific with kids, never fails to make them laugh out loud, and is a really sweet guy. Very professional -- I do not hesitate to recomemend him to all my clients. Book him today! We had Doodad come to my son's 7th birthday and, boy, were we happy we did. He was very professional when we set up the performance. And the performance itself had the kids bouncing between hysterical laughter and awe at the tricks. Gotta admit, all the adults were laughing, too. My son loved it when Doodad called him up to be part of the act. The kids loved their goodie bags and my son loved his magic kit. I'm glad we went with the premium package. Well worth the money. We give him our highest recommendation. Last June 2014 we had a family reunion in Las Vegas of which this magician was supposed to come and entertain the kids in the family and there was a couple of young children that had some minor learning disabilities one in particular that is last June 2014 we had a family reunion in Las Vegas of which this magician was supposed to come and entertain the kids in the family and there was a couple of young children that had some minor learning disabilities one in particular autistic. He was excited but a but distracting. Doodud was not happy and at one point rude and stopped his show. He was not adaptable and we were sorry he was hired. I work with special needs children and would never do that. After checking my records, I did not do a reunion on that date. I did 2 birthday parties and neither of them with this person's name. And the fact that he is leaving a review a year later leads me to believe this is fake. We had Doodad over the weekend for our twins 6th birthday party. Doodad was one of the best that's happened to a kid's party. Everyone was cracking up and really had a blast. A lot of the kids were saying to each other that they want Doodad for their party too ! We had a company party and thought it would be nice to entertain the children. We contacted Doodad the Magician. He said that he would be at the location 15-20 minutes before the show was to start, when in fact, he was 15 minutes late. He said that the adults and children would be laughing from the beginning of his show until the end of his show. Not True, in fact, the children or the adults did not laugh at his jokes. Apparently he could not start the show until everyone was quiet. When the owner's daughter was not quiet to his satisfaction, he made a crude comment "who does this one belong to? He again made a crude joke, "no one wants to claim this? and smiled. He made the comment that he didn't want to keep starting and stopping because of a 2 1/2 year old interruption. He was very unprofessional and Not Worth the money that was spent to give the children a good time. I would Not recommend him for any type of party. If I could I wouldn't even give him 1 star, but the website doesn't allow me to do so. Please if you want a Fun party, hire someone else! Just to clear up a few factual mistakes. I actually arrived 5 minutes early (not 15 min late). I do normally arrive 15-20 mins early unless I have a prior gig, which I did. I was told there would be about 20 kids. There were 3. No one wanted to volunteer to help the magician which is always part of the fun. The 2 and a 1/2 year old was constantly running through the show, grabbing my props and basically not allowing the show to continue. At that point, I did ask if anyone belongs to this child so we could continue the show. 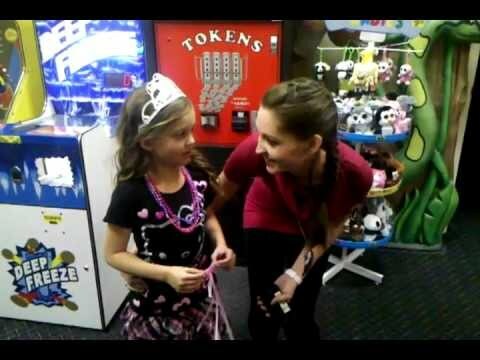 Turns out the child belonged to the hostess and she refused to take control at all. I know you can't please everyone but at least the truth needs to be told. I recently hired Doodad for my 6 year old's birthday party. He had us all laughing in no time, especially the kids. Now my 10 year old wants to BE a magician! Thank you Doodad!! Insurance: $1 million - I have performance insurance in the unlikely event that something happens. My show is completely safe but I carry the insurance for the client's peace of mind. Caution: People watching Doodad's show may experience the following side effects...Uproarious laughter, Extreme joy, Jaw droppage, fun memories that last forever. If these symptoms continue, tell your friends and family! Scott Dorfman, alias Doodad! 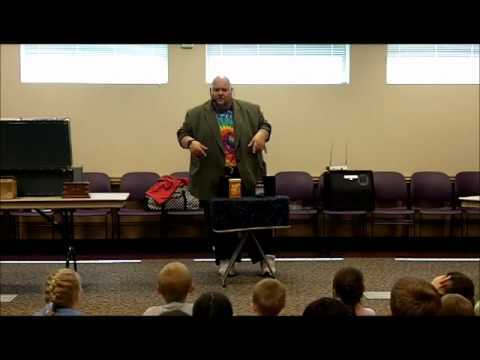 the magician has been performing magic and comedy professionally for over 20 years. I know, he doesn't look that old. But he is! (thats just more magic). He is a veteran of several hundred birthday parties ranging from age 2 to 92! Scott got his start in magic at the age of eight, when his mother hired a magician for his birthday party. That changed his life and he has been pursuing magic and entertaining ever since. He has performed as an actor, standup comic and magician all across the country. He has performed standup comedy in all the major clubs such as the Comedy Store and the Improv. Some say he is more at home on the stage than off. He has made thousands of children smile with his magic and jokes at parties and events everywhere! 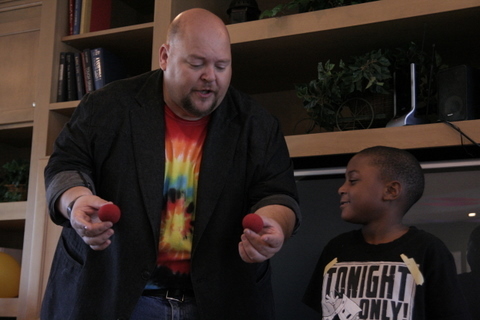 He would love to bring the same kind of wonderment he felt when seeing his first magic show to your child. All technical needs are self contained. I bring everything I need. I've been influenced the most by the magician my mother hired for my 8th birthday party. The magic happening right there in my living room stuck with me and made me want to do the same for all kids. The best conditions are inside, with a wall to my back and about 5 feet between myself and the children sitting on the floor. But this is just a preferred setup. Any situation can be adjusted to.